Warbird Information Exchange • View topic - Is it an Airplane? B25? Amelia's L10E? Post subject: Is it an Airplane? B25? Amelia's L10E? This is the 2006 GE image of the Orona lagoon. Is this an aircraft? A B25? Amelia's L10E? Post subject: Re: Is it an Airplane? B25? Amelia's L10E? Will the Nauticos expedition currently underway succeed or fail?. If it fails, will it point the way toward expanding ideas about the AE mystery or will the AE mystery simply disappear from current culture and lie forever in the Pacific depths? I'm going with "Optical illusion" for $1,000, Alex. Will all this Amelia BS ever just go away ? Well, you might call it "Amelia BS" but you keep reading and commenting. It's interesting that you keep up to date on UFO/alien sightings as well. The NOAA research ship Okeanos Explorer is at Apia, Samoa and I think prepared to depart for Howland Island to assist the Dave Jourdan /Nauticos expedition for the deep ocean sonar search. The Nauticos group is going to launch and retrieve the deep diving AUV from their ship the Mermaid Vigilance. My understanding is that the Okeanos Explorer will pass targets of interest from their wide field sonar scans to the Nauticos team and the AUV will get close up sonar and photos. Sorry I don't follow ufo sightings and I don't follow the AE Search . that David Billings and TIGHAR keep pushing. Definitely looks like pixelated water to me. Sorry.......I don't follow the AE Search . Seems you are familiar with the major ideas surrounding the AE mystery as you mention crash and sink, New Britain PNG, and the Nikumaroro theories. I think you have an interest. Those with the Google Earth application on their computer can view the location of the aircraft with the following co-ordinates using the 2006 GE image: W 172.1575 S 04.4986 or if you use degrees minutes seconds W 172º 09' 27' S 04º 29' 55". Those are selectable in your GE preferences. While you are there, un-select street view as it interferes with up close views. I think it is a Rorschach test. I see a beautiful butterfly. The purpose of the dive will be to look at rocks and fish. While Dave Jourdan and Nauticos are currently working in the vicinity (and have collaborated very productively together with the govt agency on past efforts) there is no intended crossover of the two missions. In that extreme depth of water, the hull mounted multi-beam sonar mounted on Okeanos Explorer is used only to map major geologic features and cannot manage the resolution to spot something as large as a sunken battleship or aircraft carrier, never mind the remains of a ditched Lockheed Electra. Regardless, it should be interesting to view high resolution images of the seafloor in that region. Here is another take on the resolutiion of the Okeanos Explorer hull mounted sonar from the NOAA Explorer website discussion of capabilities. The ship comes with a variety of sensors and systems, including a modern hull-mounted multibeam sonar for generating high-resolution maps of the seafloor as deep as 6,000 meters. These maps help explorers identify interesting features that warrant further investigation, and can serve as guides for conducting visual surveys using ROVs. " Emphasis my own; while the resolution may be insufficient to determine what the object is, the resolution is sufficient to determine an object is present. And if that object is standing alone in the abyssal plain at great depth, Nauticos would be interested in taking a close look with the REMOS 6000 AUV. Not a close collaboration for sure. But Nauticos said in it's daily blog they get to visit Okeanos while in the area. Information about interesting targets might be provided. These maps help explorers identify interesting features that warrant further investigation ..."
At that extreme depth, the identifiable features mapped with hull mounted multibeam will be on a geologic scale (undersea mountains, canyons and the like .. not airplane wrecks). They will serve as a guide for NOAA to conduct future ROV visual surveys with a high likelihood of observing interesting/new benthic species of fish, coral and sponges .. or collecting a good variety of rock samples. That's the whole reason Nauticos went to the trouble and expense of bringing the REMUS 6000 AUV out to Howland rather than use a hull mounted multibeam themselves .. to get down and get the kind of high resolution scans needed to locate an Electra sized target. Amelia is not part of the CAPSTONE mission. Mention of Okeanos Explorer in daily news updates has as much bearing on the pursuit of the Eustace expedition as the results of their March Madness pool. Last edited by TBDude on Mon Feb 12, 2018 10:54 pm, edited 1 time in total. That statement you quote is not my own; it comes from the NOAA website about Okeanos capabilities. We disagree on the definition of high resolution. 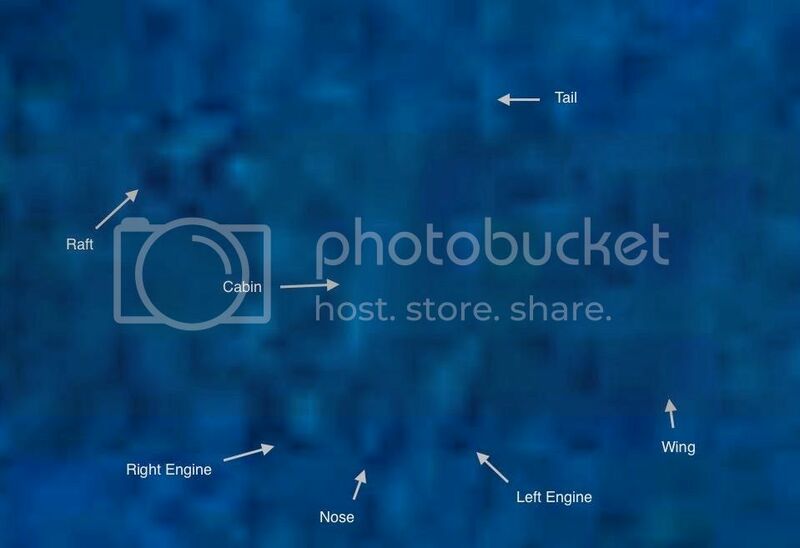 Just like high resolution satellite photos, the high resolution sonar graphical images need the necessary software to expand and select the data to be displayed. Google Earth is an software application that dynamically scales and selects the photo pixels displayed. The familiar sonar image of seamounts, submarine canyons, etc represent only the wide composite area of coverage. Just as the Google Earth view of urban areas from miles above can be expanded to show detail about the neighborhood, the wide area sonar image can be expanded to show fine detail of time/amplitude data cells. Being only able to define underwater mountains and canyons could not be called high resolution. This is a satire, right? The Okeanos Explorer is moving away from the Howland area. A limited number of search patterns around Howland. I was wrong to think the two ships had some new technique to find downed aircraft in deep water. TBDUDE was right in saying there is no connection between the two ships being in the same area; just coincidence.